Below are a selection of written works. As time goes on, more will be added. Sunday School curriculum is free to use by churches and Bible studies; however, please contact me if you use them so I can pray for you and your group. Join us at Fairfield CRC Sundays at 9am as we read through the Book of Isaiah together. These outlines contain my personal notes and observations, research on the texts, and questions to ask to prompt discussion and make sure everyone is remaining on the same page. Estimated publish date for the teaching outline for ch.56-66 is June 24, 2018. I have attached a picture with a completed "Gospel Chart" from the "Human Heart" study sheet. 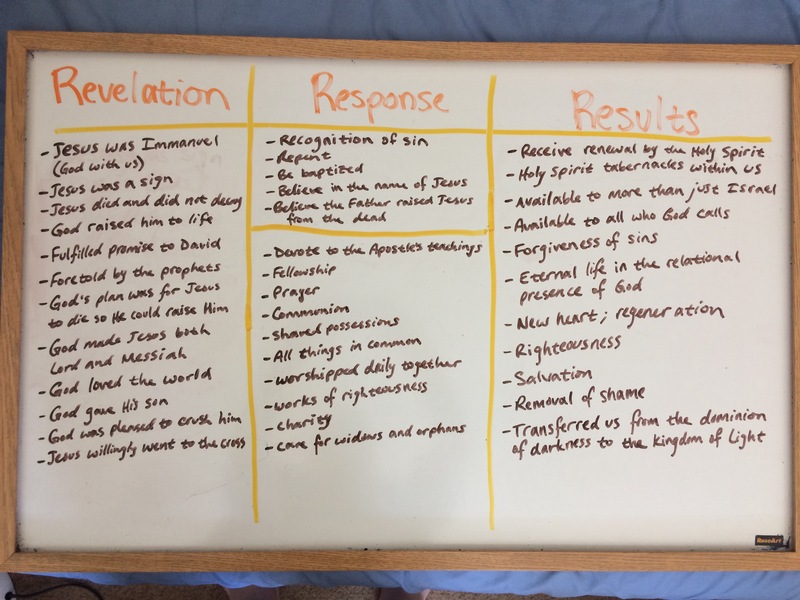 This chart includes the answers given during my Sunday School class when I did this lesson. Feel free to use it as a guide if you feel so inclined. Some passages you could use for Question 3 include John 3:16-18, Romans 3:21-26, Romans 10:9-13, 1 Corinthians 15:1-8, Colossians 1:13-14, and Titus 3:4-8, to name a few. In this paper, I dive into the Greek text of Paul's tiny letter to Philemon, and argue that Paul intentionally uses rhetorical device to set up his argument and guide Philemon to Paul's desired outcome in a manner that is wholly willful on Philemon's part. In this paper, I walk through Psalm 90 exegetically, drawing connections to its strategic placement by the Psalms compositor, and how the major themes within function in connection with the rest of the Book of Psalms. In this paper, I examine the Calvinist and Wesleyan answers to the question "For whom did Christ die?" I also elaborate on Levitical teaching on atonement, and then argue from the New Testament for the Wesleyan position. This is one of the papers I wrote during my M.Div program for a course meant to bring all of our theological meditation together to tackle a controversial contemporary issue facing the Church. I tackle the "Gay" debate and critique the arguments of Matthew Vines and Gerry Breshears, among others, and close with a description of my own view of "Gay Theology," which I call the Equality Position. In this paper, I evaluate Satan's temptations on Eve and Jesus in Genesis 3 and Matthew 4 respectively and attempt to establish a primary strategy that Satan employs to seduce believers to disobedience, namely through an appeal to virtue. In this exercise, I apply the principles of exegesis to the culturally-relevant text of the song "Same Love" performed by Macklemore and Mary Lambert. My conclusions are geared toward leaders in local churches who seek to better address this ever prevalent issue faced by the contemporary American Church.